Good Has corner dings, bends, and/or page curls. Discoloration on cover or page edges. Wear is moderate. Minimal markings. Next Day Processing. Daily shipments M-F from San Diego! Fine 1843401878 Crisp pages and tight binding. Appears unread. Light shelf wear on cover. Isn't it amazing how boats speak to each other? They don't use words like we do! Instead, they use maritime flags and other signals. Help your little ones to understand what these signals mean by going the pages of this book. Learning what they mean is an important aspect of expanding your child's level of communication. Secure a copy today! Good 1578565650 Item in good condition. Textbooks may not include supplemental items i.e. CDs, access codes etc. TIME For Kids The Big Book of How presents kids 8-12 years old with answers to the kinds of intriguing questions that appeal to their sense of curiosity. Colorful graphics, spectacular photos and clear, engaging diagrams will help answer such questions as: How does a chameleon change colors? ; How can a person survive in the jungle? ; How do you build a teepee? ; How do diamonds form? ; How do light sticks work? ; How are 3-D movies made? ; How do astronauts train for a space mission? ; How do we get cavities? ; How does solar energy work? Divided by subject area-from animals, the human body and technology to sports, food and green issues-kids will discover the background behind the questions through the book's photos, diagrams and art as well as its clear text. Of course, TIME For Kids goes beyond just answering the question, and engages kids with hands-on activities at the end of each chapter that bring life to a topic or idea they just read about. For example: If in the technology chapter kids learn how an airplaneflies, the "How to" spread might include step-by-step instructions about how to fold a paper airplane or create a rotating helicopter. TIME For Kids The Big Book of How is a must-have book to satisfy the most curious of kids. New 1454929391 BRAND NEW! In Protective Shrinkwrap! A Hardcover with Dustjacket in NEW, pristine condition. We ship all orders with delivery confirmation! Facing the loss of a loved one in a death-avoidant culture can be excruciating. Grievers may be expected to put on a brave face, to “move on” quickly, and to seek medication if they are still grief-stricken after an “acceptable” amount of time. 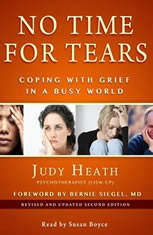 Psycho­therapist Judy Heath draws on extensive experience as a grief specialist in private practice to help those struggling with the anguish of loss. Addressing the myths and misinformation about mourning that still abound today, Heath gently coaches readers to understand that coping with loss is a natural process that our society tends to avoid and hurry people through, often leading to unresolved, lasting grief. No Time for Tears offers practical advice for both short- and long-term recovery, including how to manage rarely discussed physical and emotional changes: feelings of “going crazy” and inability to focus; feeling out of sync with the world, exhausted and chilled, and crushingly lonely. This updated second edition includes new information about medication and discusses various types of loss including that of a parent, child, spouse, friend, or pet. Helpful not only to grievers but also to those who care about, counsel, or employ them, No Time for Tears is an essential resource for grief management and recovery. Pop Trios for All is a versatile&#44; educational&#44; and fun series intended for like or mixed instruments to perform in any size group or combination of instruments. All books are in score format with each line increasing in difficulty from Grade 1 to Grade 3-4. Alternate passages and notation are included to suit instrumental ranges. With no page turns required&#44; the songs and measures are consistent which makes finding rehearsal points quick and convenient. Perfect for concerts with family and friends&#44; recitals&#44; auditions&#44; and festivals. Available for brass&#44; woodwinds&#44; strings&#44; and percussion. Titles are: Old Time Rock and Roll * Sing&#44; Sing&#44; Sing * Hedwig&apos;s Theme * You Raise Me Up * All I Wanna Do * The Magnificent Seven * This Is It! * Mack the Knife * Can You Read My Mind? * Crazy In Love * The Pink Panther * Star Wars Main Title * I ll Be There For You * American Idiot * Hips Don&apos;t Lie. Pop Trios for All is a versatile educational and fun series intended for like or mixed instruments to perform in any size group or combination of instruments. All books are in score format with each line increasing in difficulty from Grade 1 to Grade 3-4. Alternate passages and notation are included to suit instrumental ranges. With no page turns required the songs and measures are consistent which makes finding rehearsal points quick and convenient. Perfect for concerts with family and friends recitals auditions and festivals. Available for brass woodwinds strings and percussion. Titles are: Old Time Rock and Roll * Sing Sing Sing * Hedwig&apos;s Theme * You Raise Me Up * All I Wanna Do * The Magnificent Seven * This Is It! * Mack the Knife * Can You Read My Mind? * Crazy In Love * The Pink Panther * Star Wars Main Title * I ll Be There For You * American Idiot * Hips Don&apos;t Lie. Pop Trios for All is a versatile educational and fun series intended for like or mixed instruments to perform in any size group or combination of instruments. All books are in score format with each line increasing in difficulty from Grade 1 to Grade 3-4. Alternate passages and notation are included to suit instrumental ranges. With no page turns required the songs and measures are consistent which makes finding rehearsal points quick and convenient. Perfect for concerts with family and friends recitals auditions and festivals. Available for brass woodwinds strings and percussion. Titles: Old Time Rock and Roll * Sing Sing Sing * Hedwig&apos;s Theme * You Raise Me Up * All I Wanna Do * The Magnificent Seven * This Is It! * Mack the Knife * Can You Read My Mind? * Crazy In Love * The Pink Panther * Star Wars Main Title * I ll Be There For You * American Idiot * Hips Don&apos;t Lie. An updated edition of the self-published book that sold more than 100,000 copies, with a new chapter on the 2018 tax cuts.<br><br>There's a massive freight train bearing down on the average American investor, and it's coming in the form of higher taxes. <br><br>The United States Government has made trillions of dollars in unfunded promises for programs like Social Security and Medicare--and the only way to deliver on these promises is to raise taxes. Some experts have even suggested that tax rates will need to double, just to keep our country solvent. Unfortunately, if you're like most Americans, you've saved the majority of your retirement assets in tax-deferred vehicles like 401(k)s and IRAs. If tax rates go up, how much of your hard-earned money will you really get to keep? 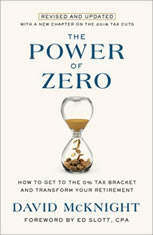 <br><br>In THE POWER OF ZERO, McKnight provides a concise, step-by-step roadmap on how to get to the 0% tax bracket by the time you retire, effectively eliminating tax rate risk from your retirement picture. Now, in this expanded edition, McKnight has updated the book with a new chapter on the 2017 Tax Cuts and Jobs Act, showing readers how to navigate the new tax law in its first year of being in effect, and how they can extend the life of their retirement savings by taking advantage of it now. <br><br>The day of reckoning is fast approaching. Are you ready to do what it takes to experience the power of zero?<br><br>Includes a PDF of charts from the book.